I already made a quilt with most of these fabrics, but I pulled them all out again because I’m quite tempted to use them for a new quilt. 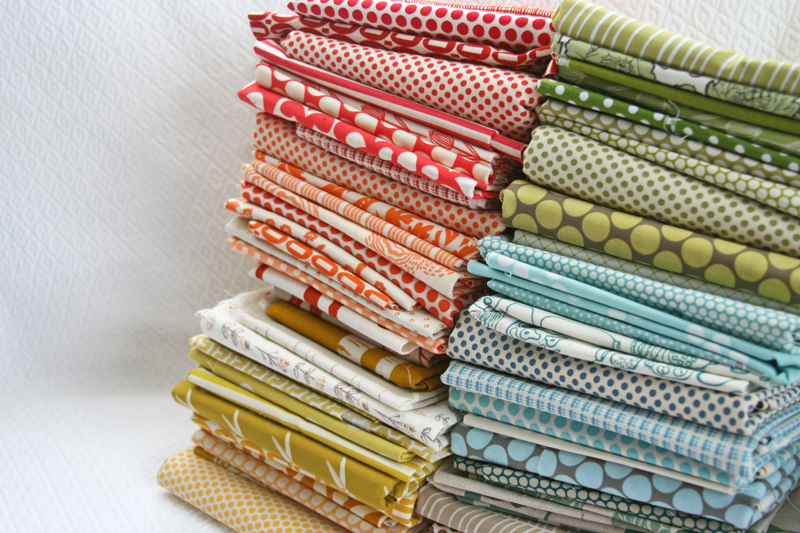 I love this rainbow of prints, especially in these lovely muted shades. So what do you think? A second quilt with nearly the same fabrics? This entry was posted in Fabric and tagged Fabric, fabric stack, low volume, quilt, rainbow. Bookmark the permalink. Sometimes you just have to revisit a great color palette! The fabrics are so pretty! I say go for it. Try a different pattern and it will be a totally different quilt. Love the colors BTW. If you do it it will work. I love following your quilt choices and learning. You have great vision. Go for it! love those fabrics! we have 3 babies coming this fall….. makes me think of other versions of quilts for them! Yes, do! I love those colors. Absolutely! Go for it, those fabrics are gorgeous. It’ll be a fun challenge to see how different the second quilt is from the first. I LOVE the color palette! I hope this time you play them up instead of tone them down with tons of neutrals. Just saying…. I think a 2nd quilt would be fabulous! I wish I could develop a stash like that. I love everything about it! So yes, to another quilt out of them! Yes I love these color! I say go for it! Don’t forget to show and tell! Gorgeous! Go for it – I can’t wait for the pictures! Yes! The other one is so very unexpected (and wonderful), with the inclusion of all the neutrals. I’m anxious to see what you’d do this time. Yes, but the red (7th? from the bottom) jumps out at me as brighter than the rest of the stash. You have it sandwiched between a red and an orange polka dot in the bottom photo. Go for it. Isn’t that what different patterns are for? i think you should, they’re such great fabrics & make for a spectacularly sophisticated quilt – these fabrics seem quite grown-up to me. Can’t wait to see what you do. Yes, another! Love the fabrics. YES!!! I could not look at that and wonder if I should, but WHEN I should. Can’t wait to see results. Go for it. More than likely you will create something different. Beautiful fabrics — go for it! It won’t be a rerun — it will be the second in a series! I just did a Bargello wall hanging in rainbow (bright) colors. I think a Bargello in these colors would rock 🙂 Hey it’s beautiful fabric, it will make a beautiful quilt !!! Oh and it helps that your a talented quilter…lol DO IT !!! Oh, Silly question! OF COURSE you should!!! 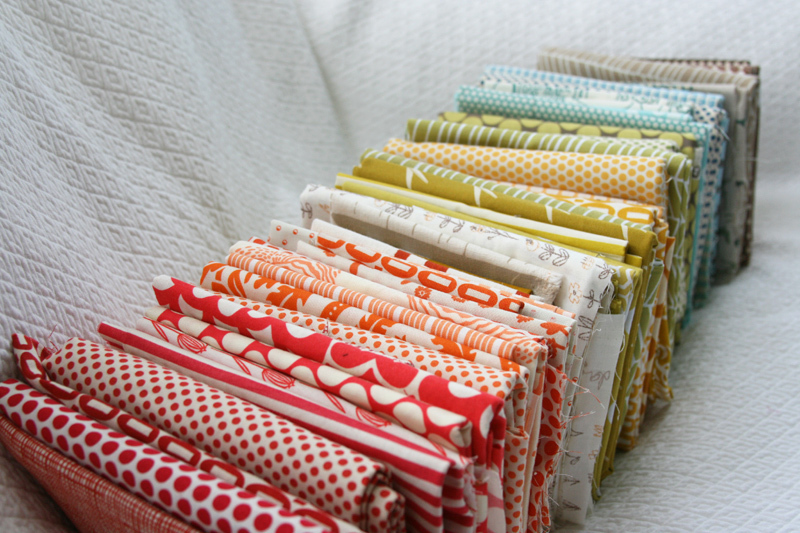 Love all these fabrics! Absolutely do it! Nothing wrong with (re)using fabrics you love. And in a different design it will look completely different. Most definately another work of art with the palette of colors I like, and hey maybe a pillow case edged with them as well! You got the fabrics because you love them.. the affair doesnt stop after one use!! Go for it, beautiful fabrics work into all different wonderful things. I love the colours! And the Trailmarker quilt you made with them is gorgeous. Maybe for this next project, trying switching it around a little. Move around the wheel some; for example, trade the greens for purples? Can’t wait to see what direction this takes! When fabric calls, I answer. Follow your rainbow! Wow. What a pile of deliciousness. It’s such a winning combo begging for another reincarnation. I have also been hesitant to use the same fabrics for a different quilt, but if it works it works. Plus using up the stash is a win. Hi, I’m a rank amateur quilter, and I would love suggestions about books or other resources to learn about using color in quilts. Please leave a note here or feel free to email me at smw380 at yahoo dot com. Thank you so much! Man, I love this stack! I think you could make a completely different quilt with these same fabrics.